Home Bouquet Breakdowns	Bouquet Breakdown: Sweet n’ Summery Bridal Bouquet! 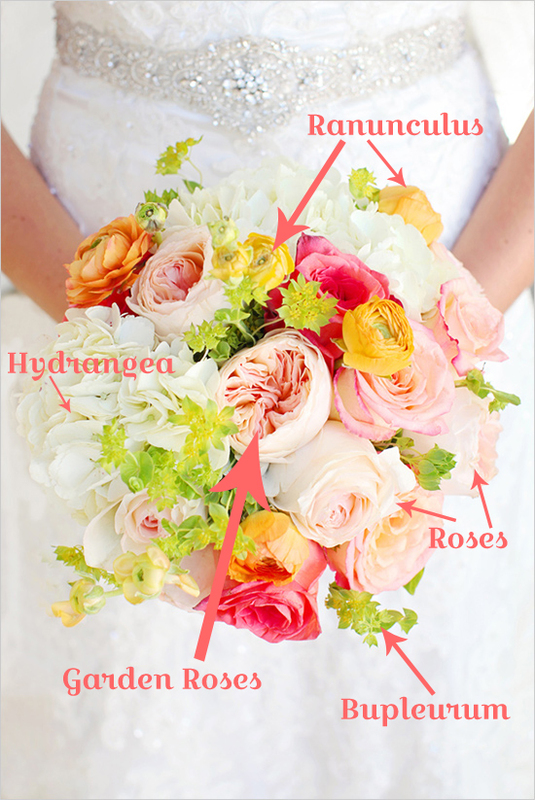 Bouquet Breakdown: Sweet n’ Summery Bridal Bouquet! It’s been a while since I have done a Bouquet Breakdown, so when I came across this Sweet n’ Summery Bridal Bouquet I just knew I had to share! And since this weekend marks the official start of Summer, it couldn’t come at a more perfect time. I came across this bouquet while browsing Wedding Chicks, a blog I can always count on for chic wedding ideas, and I hit the jackpot, because the full post contains the recipes for 5 different, all lovely, bouquets! So, if your looking for even more bouquet ideas, be sure to check out all the recipes here. 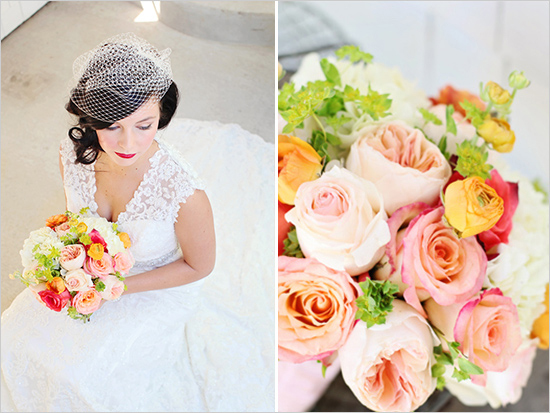 I love the soft, summery citrus hues with just the perfect pop of pink… It just makes me so happy! And the Bupleurum is one of my favorite greens, with it’s tiny yellow flowers and fresh green leaves…perfect for a Summer Bouquet! Flowers used in this Bouquet: 2 White Hydrangeas, 5 Juliet Garden Roses, 2 Bupleurum stems, 7 Orange Ranunculus, 4 High and Fire Roses (try Pink Ice or Duet Pink and Cream Roses for a similar look), and 2 Classic Duett Roses. What do you think about this Sweet n’ Summery Bridal Bouquet? Tell me below! And, as always, if you want a Bouquet Breakdown, remember to comment below with a link to the picture!